Nice stay , beautiful ground , Kim on the front desk is an asset- can do person , very friendly and helpful. More of a leisure stay than business as phone connection is far from good . Staff were friendly and helpful, they made us feel very welcome. Our room was lovely, very comfortable and well looked after. 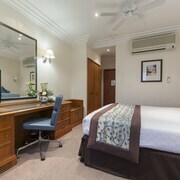 The hotel is ideally placed for the cathedral and the centre. Breakfast isn’t available at the hotel but plenty of good restaurants are a short walk away.